Identifying and maintaining the best type of extraction and filtration for both wet and dry grinding applications can bring a range of business benefits. These include cost-savings through increased coolant life, improved surface finish and reduced production down-time. Most importantly of all though is the benefits it can bring to employee health. CoSHH (Control of Substances Hazardous to Health) regulations require all employers to use and maintain effective control measures to protect employees from exposure to hazardous substances - a subject oil mist extraction specialist Filtermist has extensive experience in. 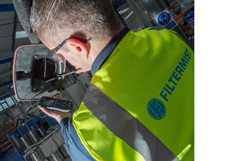 Read on to hear tips from some of Filtermist’s extended team on the best way to ensure your operatives are working in a safe and productive environment. The swarf and sludge produced in grinding will contain metal fragments from the material being machined, as well as particles from the grinding wheel, and general dirt and debris. “Viscose media is widely used for filtering coolant used in grinding machines, but it’s not always the most effective. The type of coolant varies in viscosity meaning that some of our stronger/coarser grade materials can often be more suitable as they have greater fluid penetration characteristics letting the coolant through more easily than finer grade media. Whilst tearing can be a frustrating issue, a more harmful occurrence is filter bypass. This happens when the contaminated coolant cannot penetrate the filter media. Fluid will always take the path of least resistance and can at times simply pass over the sides of the filter media and into the coolant tank. This unfiltered coolant is then re-used in the machine tool which can impair the quality of both the tool and the components being produced and impact on the surface finish. This short CGI film explains more about the importance of effective process fluid filtration. The value of responsible fluid management is well recognised, for both environmental and safety reasons, as well as from an operations and financial perspective. Filtermist works with a number of fluid suppliers including Houghton International and Fluid Solutions to ensure effective extraction and filtration is a key offering of their wider fluid management programmes. Tramp oil skimmers are designed to remove the tramp oil from the surface of the coolant sump. If left to accumulate on the surface of the coolant, tramp oil can lead to a build up of bacteria which affects the quality of the coolant and poses a health risk to machine operators. This interview with Rob Wilson from Fluid Solutions explains how using tramp oil skimmers benefits Fluid Solutions’ customers. Pre-filters and afterfilters offer additional filtration stages to ensure as much particulate as possible is removed from the air. 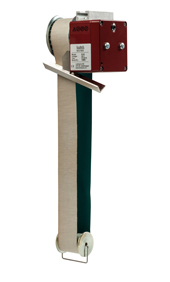 The cyclone pre-filter is specifically designed to collect swarf before it enters the centrifugal filter. The system is attached to the inlet of the Filtermist unit and the contaminated air passes through it. The low-pressure area within the separator encourages the heavier particles to fall to its base where they can be easily removed. Filtermist also offers the CSX low level stand which includes an inbuilt pre-separator for more demanding grinding applications. 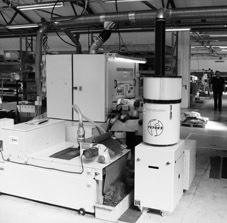 In some applications, a single filter fitted to the grinding machine will be more than adequate, but others may require multiple filters connected to machines in cell-based production areas - as per this case study about a Filtermist installation at Boneham & Turner. Dust and fume that arises from using grinding wheels in dry applications also needs to be effectively removed from the work area to ensure it doesn’t pose a hazard to health. Kevin Hood, Sales Director at Filtermist owned Multi Fan Systems, elaborates; “As with wet grinding, the nature of specific applications will dictate the best extraction system. Sometimes individual filters offer the best solution, alternatively the dust and fume from grinding operations can be captured as part of a centralised extraction system designed to remove a range of contaminants from workshop air. As well as extraction equipment from sister company Absolent AB, Filtermist also supplies UK manufactured industrial dust collectors from subsidiary company Dustcheck Ltd. Dustcheck was founded in 1978 and has since established a reputation as a leading provider of effective dust extraction equipment used in a wide range of applications including grinding, shot-blasting and powder coating. Once an LEV (local exhaust ventilation) system has been installed, it is a legal requirement that it is tested by a competent person at least once every 14 months. More details can be found on the HSE website: www.hse.gov.uk/lev/. 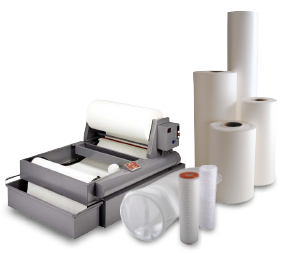 Find out more about the products and services mentioned above by following these links: directfiltration.co.uk, multifansystems.co.uk, dustcheck.com, or call the Filtermist sales team on 01952 290500.